For the first time in I don't know how long I decided to join in a challenge. I love the Celebr8 Packs that you get here each month and this month's is a cracker. You can find the details to the challenge HERE if you are interested in playing along. This is the sketch that you have to use. You also have to use 8 items from the kit. So here is my layout. My journalling on the back of the layout says. My Scarlie, you are just the happiest little thing ever. You are quite happy to be passed around from person to person, and carted around from place to place. You are not phased by trying new things and you just love texture. Nothing makes you happier than playing in the sand, or in the water or even on the grass, with the leaves that have fallen from the trees. It was so hot this Sunday and we were all going out for lunch. We thought you might like to cool of in the pool before we went. Daddy took the net off the corner of the pool and you played happily for a good long while. Splashing away and making happy noise. You started off just dipping your toes and ended up almost naked swishing around, most content. You watch everything and everyone around you and nothing makes me happier than to see the recognition in your eyes when you see me, you never took your eyes of me as I was snapping away, wondering all the while what was going through that little head of yours. I am such a sucker for my grand babies. 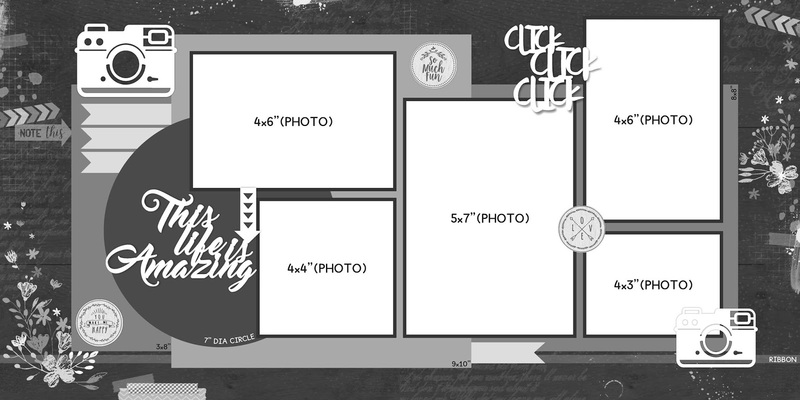 Here are some close ups of the layout. I just loved the grey chevron paper and the splashes of colour were perfect for my photos. I opted to back it onto a polkadot background paper as I wanted to highlight the turquoise and coral. I added some transparent matte texture paste through the stencil that was part of the pack and added a little more of the colours by smooching using my distress crayons on top of the texture past and I then added little flecks of gold foil. The dandelions on this paper are just gorgeous and I wanted them to be part of my page so I doodled the lines in black and added gold foil at the tips. I adored the little hearts and painted them with abandoned coral distress paint and when they were dry I added some foil to them as well. The chippies were all coated with diamond glaze and then covered with glitter. I used a number of the cut apart quotes and things, some around the page and some tucked behind the photos. The two cameras were also coated with abandoned coral distress paint and hit with the gold foil. I also used the stamps on the little labels and then I cut out one of the little cameras and attached that too with some diamond glaze and foil. I used the little daisy flowers and layered them with some peach petals and tucked in some teal ones too., and finally scattered around a few sequins. I really had a lot of fun with this layout and the papers are really so awesome to work with. I have made a couple of other layouts which I am just going to post here too. 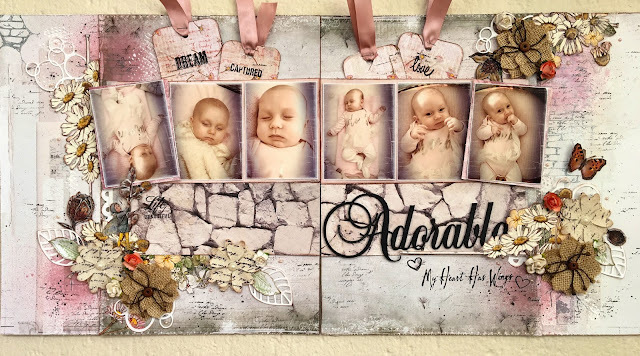 This layout is from Gerry van Gent's class at our annual Scrapbook Expo. A little out of my comfort zone but I love how it turned out and the papers were perfect for my photos. Scarlett, I love that each one of my grand babies has shown or taught me something new. I look at you and I am so amazed that here you are, nearly four months old in these photos, and just how much your life has changed since leaving the safety of your mommy's womb. Everything was so peaceful and calm for you there and here you are bombarded with sights and sounds and tastes and you have taken to it like a duck to water. The miracle of life I reckon. Your mom has you on a routine that works well for all of you and you have slotted in like you have been doing this for a lifetime. I can't get over what a happy, content child you are. Your needs are not big... a bed to sleep in, a dry nappy and regular feeds. As long as those needs are met you are happy to stay home or sleep out, you really are such an easy child. I look and you and wonder what you will be like as an adult. I think you are going to have a wicked sense of humour. I see an intelligence in your eyes already, I am so happy that mommy and daddy read to you and stimulate you each day, through all of your senses and I hope that you will have a love of books and that you will always read. Know that I will always be here for you no matter what. You two are just the most special little beings and I have so enjoyed my time with you. Watching you grow, and learn and develop and watching your little personalities come out. Paige you are loud and vocal and one of the most affectionate little people I know. You are wary of strangers but so loving with those that you know and you are obsessed with the arrival of your new little cousin. You have an obstinate streak in you and you want what you want when you want it. Spence you are one of a kind, the gentlest little boy I know. You are loving on your own terms and you are fiercely protective of your sister. You are quiet and will play on your own constructing your games and playing them out. I love that you two are best friends and even though you have your moments you get along so nicely. You share - most of the time :D and you won't do anything without the other. I hope that you never change. Here is another one that I did for a class. You have gone from 0 - 4 in 2 seconds flat. How did that happen. You were a very cute newborn even though newborns are really not that cute but now you are just adorable. It amazes me how much like your mommy you are at the same age. Two peas in a pod. I am so lucky that I am your Glan and that I get to go on this amazing journey called life with you. I hope that I will be around for a long time to come and I am so looking forward to spending lots of time with you. I just want you to know that at four months you are already so loved by those around you. You are a very lucky little girl. I am a very lucky Glan. 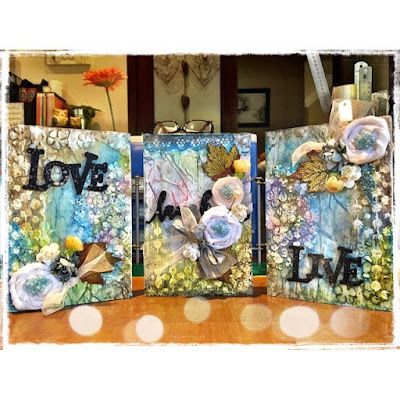 This next layout was one with did with Glenda Viljoen at our annual Scrapbook Convention. I loved this paper and I chose to tone it down from the original a bit and I used photos from our three month trip overseas. Simon and I both love of travel and we have been so lucky that we have been able to travel as much as we have, we also like to travel alone except when we are in Ireland and then Will comes with us. I think that we have explored every nook and cranny of Ireland too. As we were travelling I happened to look down a little alley and something about it caught my attention and I yelled stop. Stop we did and we got out and went to explore it was a lovely little street with a pub, a coffee shop and a couple of other little shops, some animals in a field and some lovely sign posts and flower baskets. We decided to have some tea and coffee with scones and strawberry jam with clotted cream. YUM! The sun was shining for a change and we sat outside and just enjoyed being...There is just something about this place that makes me feel like I belong. This is the second project we did with Glenda. Three little wooden works of art which sits on one of my book cases. I just loved this mixed media piece. This last one to show you is from our class with Theresa Collins. I just loved this one. CAS - just my style too and sooooo blingy. I used photos of Simon and I over the years. This one has a little flap there on the left hand side which opens to reveal more photos. Just my kind of a project. We have been married for 39 years this year and there have been more ups and downs than I care to remember but I love that we have worked through them all and that we are still together and still going strong. There is no one else that I would rather have in my corner than you. You are my rock and I love you more now than ever. Thanks for stopping by to take a look and for taking the time to leave me a comment. I really appreciate it. Wow Valerie! What a fabulous post packed with so many beautiful projects! Your layouts are obviously made with lots of love! I appreciate your attention to detail! Thanks for the inspiration! LOVE the sketch and the page you created is absolutely beautiful!! ALL the pages shared are amazing!! So nice to see your beautiful work. Loving the colors in the cards. The pages of your and your hubby are fabulous. Love the gold and happy 39 years!!! <3 Oh my, your work always amazes me!! Ok - I'm back with my cuppa and ready to drool over the creativity. First things first. "This is the life" page is a delight showing your wee girlie dipping her toes in, having a snuggle with Papa. Love the camera and heart treatment, as well as the gold leaf. "My heart has wings" is so soft and pretty with the daisies. We can't get that particular range here. Something to do with copyright. Love, love, love "Moments" with your darling twins interacting so beautifully. I'm crazy about that paper, just perfect for little Grandies pages. The hearts and flowers are perfect for your "Baby girl" page. They change so quickly, it's wonderful to have lots of photos. Having just been to Ireland, I can appreciate your cry of "stop" at random places; this little street is gorgeous. As are the works of art on your bookcase. Last, but not least, is where it all began, with you and Simon. 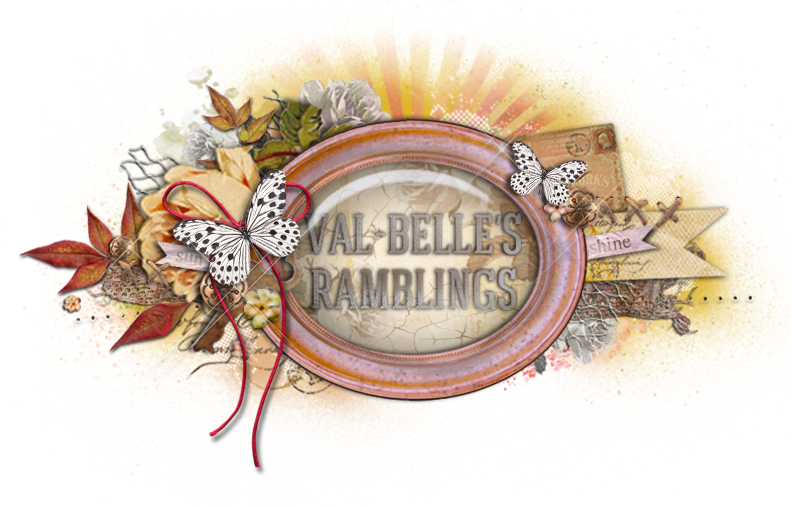 Love this glammed up page, for a glammed up Granny. Wonderful to see the photos through the years. And for me, always, the cherry on the top, is the journalling. It brings everything to life and leaves a precious legacy for those we love. Thanks for sharing. Wow so glad to see you are continuing to create beautiful layouts! Love each one, so many details and the photos are so precious. Great memories scrapped and cherished. And well done on 39 years! Have a wonderful week! Wow...so much beauty ...these are just delightful! ;-) Each page has a beauty and speciality of it's own....love the moments one!